The cold, lonely nights of winter got you down? On the outs with with the Mister/Missus and looking for emotional support when banished to the droopy basement futon? Luckily for you, YD Industries has developed the perfect solution for any shivering and lonesome companion seeker: The Spud Cuddler! 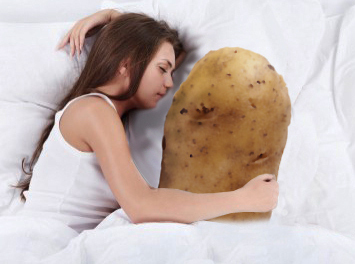 The Spud Cuddler is the antidote for cold and lonely winter nights. The Spud Cuddler is a 137lb, thermally insulated, warmth generating potato that makes the ideal nighttime cuddle partner. Combining the latest data in relationship psychology with space-age advances in insulation technologies and agricultural gene splicing, talented YD Industries researchers have developed a personal intimacy product that is guaranteed to satisfy even the chilliest of winter consumers. The fruit of all this research is that anyone curling up with a YD Industries Spud Cuddler is guaranteed an oxytocin boost that far exceeds levels observed in control group subjects covered with puppies. To get started, simply unwrap the Spud Cuddler from it’s protective mylar shipping sheath and you’re immediately ready for non-stop cuddling. It’s really that easy! Begin with simple positions, such as spooning, and move on to more advanced cuddle configurations such as straddle mounting or the over arm cling grip. A whole world of discovery awaits as you explore every amorous and loving nook and cranny of your very own snuggly Spud Cuddler! The Spud Cuddler comes in three distinct sizes for different body shapes and cuddle requirements. The sizes are small, medium, and large. Talk to your local Spud Cuddler merchant, or give YD Industries operators a ring for a FREE consultation about what size will be best for your body type. Order now, and you could be cuddling as soon as tomorrow! Celebrities and luminaries using the Spud Cuddler include, but are not limited to: Brent Musburger, Michelle Bachman, Mia Hamm, Linda Hunt, Guy Kawasaki, Suze Orman, Brad Paisley, and the Harlem Globetrotters. Keep your Spud Cuddler from hot oils or fires to prevent overheating and cooking. Unit is shipped in a wooden box with very large stamps on it.